When it comes to bifolding doors, few doors come made by the company behind them. However, three well-known brands available, made only in one factory are Origin, Sunfold and Sunflex bifolding doors. Therefore, we compare these three fine aluminium doors, helping you learn more about them. In particular, Origin, Sunfold and Sunflex offer outstanding quality, a professional dealer or direct way to buy and at the same time enhance your home with a great sliding folding door. Origin bifolding doors with curved fanlights. Comparing Origin, Sunfold and Sunflex Bifolding Doors. First of all, Origin, Sunfold and Sunflex bifolding doors are marketed and well-known for their premium quality. Every one of these well-designed and made doors enjoy an enviable reputation. In fact, Origin, Sunfold and Sunflex along with Schuco are arguably the four bifolds on the market homeowners are likely to be aware of in their overall research. Of course, there are many other bifolding door brands to buy, however, these are some of the best known thanks to proactive business to consumer marketing. With over forty bifolding door brands or systems widely available in the UK, these three businesses successfully market themselves directly to the end-user buyer, asking for the product by name as a result. Besides one factory making these doors, suppliers of Origin, Sunfold and SUNFLEX operate within the premium market. Therefore, of these three, which is the better bifolding door? The Origin folding door has transformed the market through Origin’s consumer-direct marketing, unbeatable lead times and customer service. As well as their market-leading bifolding door product, Origin also provides flush casement aluminium windows. There is also the Origin Inline Slider – a minimalist aluminium inline sliding door with a thin 20mm interlock. Every Origin door is made in the UK. Importantly, Origin loves to engage directly with the end-user customer. First of all, you get a consumer-facing website, answering all the questions a buyer may have. You can even buy Origin bifolding doors online, choosing one of the standard colour products as well as options for fitting. Established in 1989, Sunfold Systems is credited as the first company to bring bifolding doors into the UK. 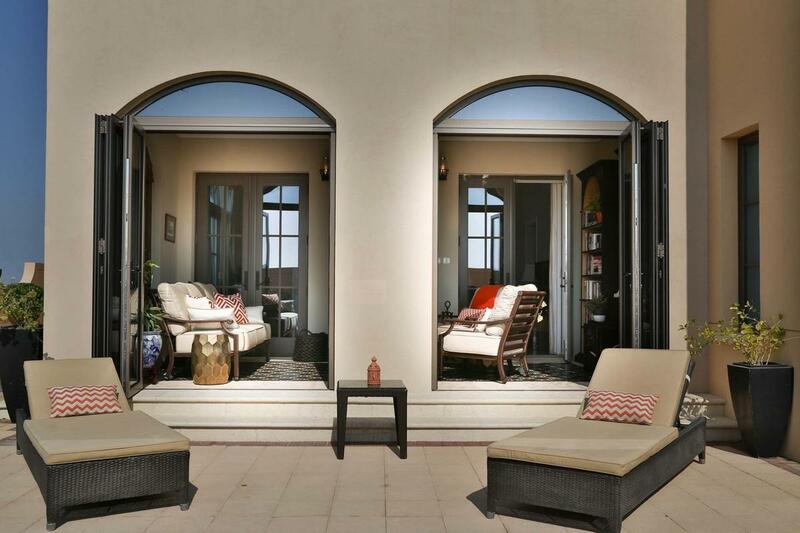 The Sunfold door is prestige, meticulously crafted as well as excellent attention to detail. Besides offering high quality products, customers wanting a Sunfold door also deal direct and not through a network of installers. The company manages the project from start to finish. Additionally, Sunfold offers a complete home improvement range of products including lantern roofs, interior doors, commercial sliding and folding doors balustrades and canopies. The SFT60 and SFT80 are the main bifolding door products from Sunfold. Also available and covered extensively on our website is the latest air 800 bifolding door. Like Origin, Sunflex UK offers their premium range of folding doors through a network of Dealers. Every SUNFLEX door is sought-after and serves the high-end home improvement market. Also available are slimline sliding doors as well as slide and turn doors. 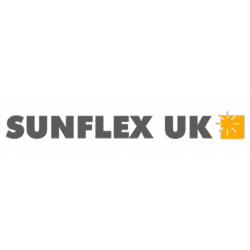 As well as bifolding and sliding doors, Sunflex UK also provides a full home improvement range such as roofs, Wintergarden constructions and frameless doors. All Sunflex bifolding doors are made in Germany. The range of bifolding doors from SUNFLEX is well-known for its excellent engineering, innovative door hardware, contemporary appearance as well as the reputation the company enjoyed internationally. Is the directly made bifolding door the better door? The marketing message of companies like Origin, Sunfold and Sunflex is you know exactly who makes your doors. As a result, many homeowners base their buying decision on this. They like the transparency as well as the ability to deal with the manufacturer direct. However, and for balance, it’s important to also explain the other brands available made in many different factories. For instance, aluminium systems such as AluK, Smart Systems, Schuco, SAPA Building Systems, Senior Architectural and Reynaers. Every one of these and others are fine doors when well made and fitted. These brands successfully operate using the approved manufacturer route to market. They supply their aluminium profiles and accessories to manufacturers all over the UK. Therefore, these doors come widely available and importantly, at several different price points. Where and how you buy these doors also affects the price you pay. Origin, Sunfold and Sunflex make their doors. Of course, this does not mean a premium product such as the Schuco ASS70 bifolding is inferior. Doors coming from many different factories is nothing to be worried about. Every systems company works hard to train and therefore approve its manufacturers, otherwise, it would not supply them with materials. However, what you do get with many different manufacturers is no absolute guarantee of consistent quality. Again, this does not mean the doors are bad – just unlikely to be exactly the same in every way. With many factories making the same product, invariably, no two doors will be identical. In other words, the systems company cannot control how every manufacturer makes the doors. However, no good manufacturer is in the business of providing substandard products either. Every manufacturer ensures they make their doors to the technical manuals and training received from systems companies. To do otherwise would result in problems throughout the entire supply chain. In other words, buying a door made by many different factories is not a negative factor. Any correctly made and professionally fitted bifold is reliable. 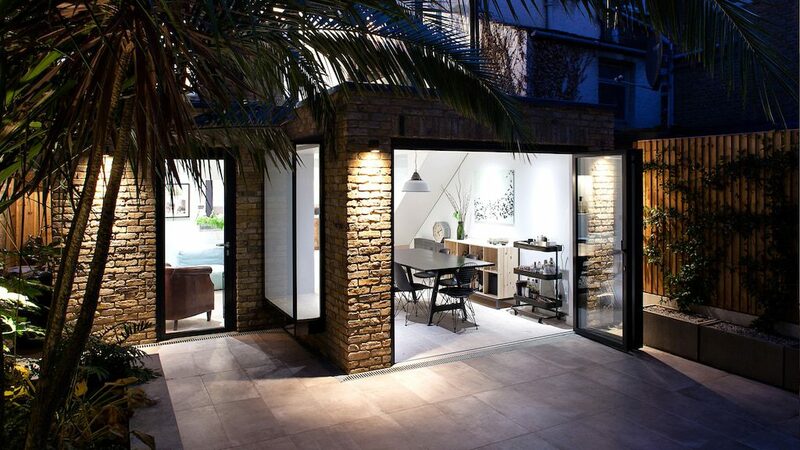 The benefits of buying bifolding doors direct. The one thing other systems companies cannot control is who fits their doors. Many of the manufacturers mentioned operate in the trade supply market. Therefore, they are in business to sell doors to whoever wants to buy them. As a result, Origin, Sunfold and SUNFLEX control better who fits their doors. Other systems companies approve the manufacturer, but rarely the installer. Once again we stress, this is not necessarily a negative when buying other bifolding doors. Do your research and check out the credentials of your chosen installer. However, there are advantages to buying a bifolding door system from a company that also makes it. Greater control over who can supply their doors. The overall perception of a better made, higher quality door. Customer confidence in dealing direct. A unique selling proposition for many installers compared to multiple manufacturers. In the case of Origin, they invest substantially in training their dealers as well as giving them all the marketing support, installer training and one-on-one service. For this reason, Origin dealers benefit hugely as does the homeowner. One only needs to visit an Origin showroom to see how well the company supports its quality dealer network. When it comes to premium bifolds, many homeowners also regard German-made bifolding doors to be better also having overall higher quality perception. Your at-a-glance guide to Origin, Sunfold and Sunflex doors. Three of the best bifolding doors for your home. Origin has for a long time demonstrated itself as being the innovator for service. No other company offers the impressive lead time, bifolding door colour options and the range of dealers nationwide. On this basis, the Sunfold and Sunflex door can arguably be perceived as more exclusive owing to their more limited availability. Sunfold and Sunflex offer a broader range of bifolding door products where Origin has just one. Besides exterior bifold doors, you also get internal doors, as well as bespoke doors and one-off designs. Their doors are designed with the architect in mind, for instance, having faceted and curved doors in the range. With Sunfold and Sunflex, you also get much slimmer doors, and a bigger choice of thresholds too. SUNFLEX and Sunfold also sell a ‘true’ internal bifolding door. These come slimmer, non-thermally broken and specifically intended for inside the home. As well as more bifolds on offer, Sunfold and Sunflex also have more products in their overall portfolio. Customers wanting one supplier for their entire home also get internal doors, lantern roofs, glazed extensions and hybrid windows and doors. SUNFLEX faceted bifold doors curving inwards. The Best Lead Times anywhere. One of the thinnest bifolds on the market with 100mm door sight lines. 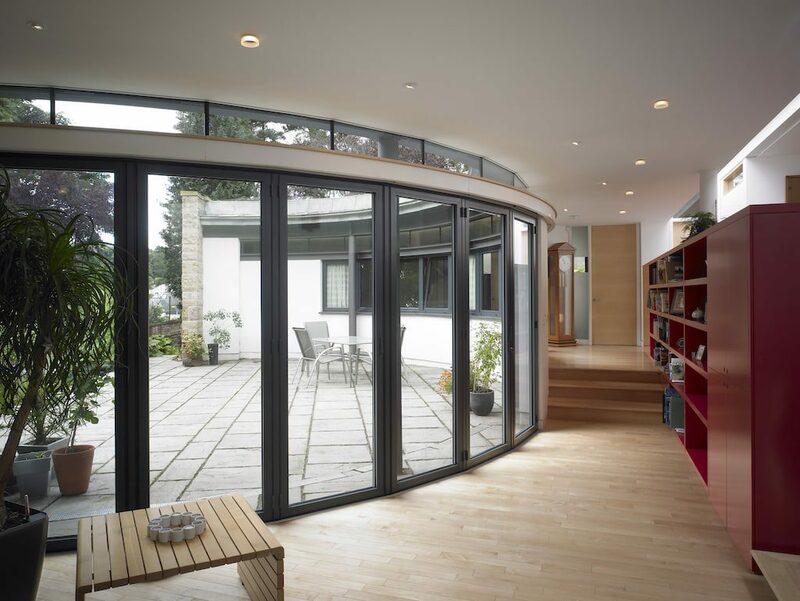 Curved or faceted bifolding doors are possible. Sunfold unique high security locks. Full home improvement range available. Top Five Features of Sunflex Bifolding Doors. 3500mm door heights are possible and 115mm sightlines. The latest SF55e model is a top quality door at a mid-range price. Matching slimline window suite available. Can incorporate an opening window in a bifold door. Choosing between Origin, Sunflex and Sunfold bifolding doors. The Origin bifolding door is ideal when looking for doors quickly. In fact, Origin makes standard colour doors in 24 hours for their dealers. For this reason, Origin’s unbeatable and enviable lead times is one of the many reasons people buy these quality folding doors. Many renovation projects have structural openings ready for doors, with customers not wanting to wait. Importantly, Origin serves those wanting to move their project forward to a speedy completion. The 20-year warranty, colour matched gaskets, woodgrain door options and customer service are also reasons to buy Origin. Importantly, most areas of the UK have an Origin dealer, making these doors accessible too. Finally, Origin doors usually cost less than Sunfold and Sunflex. On a technical level, Sunfold and Sunflex doors are slimmer and also offer more threshold options. You also get a bigger choice of bifold door models – Origin offers just one. The Origin product range includes windows, sliding doors, and residential doors only. Sunfold and SUNFLEX also provide roofs, slide and turn doors, hybrid patio doors and an altogether bigger range. The fact that Sunfold and Sunflex doors are made outside the UK affects their lead times, but anyone wanting these fine doors will be happy to wait. Despite being made in Germany, we have never heard of issues with service work or spare parts where they may be required. Both companies offer excellent customer service in the UK. Above all, with any of these doors, you get high quality bifolding doors with an excellent business behind them. What you need to decide is how the individual features of these doors can benefit you and your home improvement project. We also suggest you check out the newest SF55e bifold from SUNFLEX. One of the highest specification and thinnest bifolding doors available at a mid-range price. Ask a question or seek advice about bifolding doors. It is also worth pointing out that while these three companies make their doors, contractually you are dealing with Sunflex, Origin and Sunfold dealers as independent businesses and not directly with the manufacturers. The usual buyer beware considerations apply. If you would like further information about these bifolding doors or where to buy them, please contact us. Hi Mark, thank you for pointing this out and now corrected. The SUNFLEX sliding patio door review.